Personal injury cases top the list of civil litigation cases filed each year in the United States. The statistic is not surprising. Simple, everyday accidents often result in injury and often, someone is to blame. Nursing home negligence, playground accidents, head injuries, dog bites, and slip and fall accidents are just a few of the causes of personal injury. 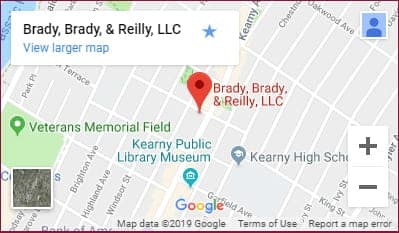 The Essex County personal injury lawyers at Brady, Brady & Reilly LLC have been dedicated to serving New Jersey families for more than 50 years, working to protect the rights of injured accident victims. If you or a loved one has suffered an injury due to another person’s negligence, it is important to understand your rights under personal injury law. State limits regarding the time that is permitted to elapse between the arising of a legal claim and the filing of a lawsuit based on that claim is called a statute of limitations. New Jersey’s statute of limitations as it pertains to personal injury cases is two years from the date the injury occurred. This means that if an individual does not file a lawsuit within two years, the New Jersey court system will refuse to hear the case at any time. The individual’s right to receive any compensation for damages sustained from the injury will be lost. What if I share some responsibility for the accident? If you have suffered an injury and share some level of responsibility, this will impact the amount of compensation you receive from the other parties. The state of New Jersey follows a “modified comparative negligence rule” in shared fault injury cases. This means your compensation will be reduced by an amount equal to your percentage of fault in the accident. So, for example, if it is determined that you are 30 percent liable for the accident, the compensation you receive from the other at-fault parties will be reduced by 30 percent. If, however, it is determined that you share more than 50 percent responsibility for the injuries, you may not receive any compensation.